It's week ten, and at the start of the season, few would have thought probably the biggest game of the Southern Conference season would take place in week ten. Given the four games that are on tap this weekend, most would have thought this week would be a cake-walk week for the four teams expected to lead the conference in the preseason. With Samford playing Concordia, Furman at VMI, the Citadel at Mercer, and finally the preseason favorite, Chattanooga at lowly Western Carolina. Yep, in preseason, this looked to be cup-cake week in the SoCon for the preseason top four. Fortunately, those preseason predictions haven't held up very well. As we now know, league leading Chattanooga visits, the other league leader, Western Carolina in week ten. So, who would have dreamed it in the preseason, Western Carolina playing for first place in the SoCon, in week 10. 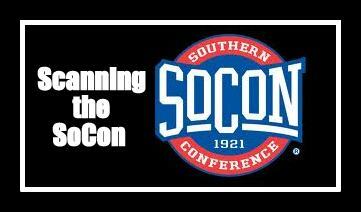 Monday through Friday for the next two weeks, one of the regular Scanning the SoCon participants will be previewing their basketball team. Today, Purple & Gold has a preview of the Western Carolina Catamounts. Western Carolina Preview: Rebuild or Reload? Replacing the four seniors that took the Catamounts to the SoCon championship game two times in the last three seasons will be a difficult task for Western Carolina. 'It’s an interesting mix,” said Head Coach Larry Hunter, speaking about his roster of six upperclassmen (two seniors, four juniors) and five freshmen. Hunter recently had his contract with WCU extended for three years, and will be in his ninth season as head coach with the Catamounts. “We’re going to get there,” an optimistic Hunter said. - read the entire preview on MocsMania. Welcome to this week's Purple & Gold SoCon Power Rankings for the week beginning 10-27-14. The Power ranking are published weekly on Tuesday. This week, the SoCon will feature three conference games, one out of conference game, as well as Wofford's bye week. Saturday's games will start at 1:30 pm with Furman at VMI, then at 2:00 pm - Chattanooga is at Western Carolina. Then at 3 pm, Samford takes on Concordia College, and to finish off the day, The Citadel is at Mercer. This week's monster game is Chattanooga at Western Carolina. It features the only two teams remaining without a conference loss. The winner places itself in the drivers seat for a conference championship and the conference's auto NCAA bid with the victory. The Mocs are coming off a difficult game, surprisingly against the newest football playing member of the conference, however they did pull out a 1 touchdown win, enough to hold on to first place in the rankings. How does the near loss bode for the upcoming away game at Western Carolina? the Mocs have been known to flake out in big games. The Cats remained tied for first place in the conference as they picked up their fourth conference victory, and broke a three game winning streak held by the Citadel. Up coming - this season's SoCon big game - Mocs at Catamounts. Remember, to be the man, you've got to beat the man! and until they are beaten, Chattanooga is the man in the SoCon. Seemingly flying under the radar, the Terriers continue to win conference games, and are still in the race for a conference championship. With only one loss, the Terriers will need some help to get there, but they are doing their part - winning. This week, the short haired dogs, rest and recuperate. The Bulldogs made a statement last Saturday with their dominating win over the Paladins, but with 2 conference losses, they are most likely our of the hunt for a share of the conference title, but they can perform the role of spoiler. With no conference wins, and only 2 victories otherwise, the Bulldogs will be playing for pride the remainder of the season. That starts this weekend when they travel to Macon to face the upstart Mercer Bears. Will the Bears pickup that second conference win this week? the Bulldogs are determined that will not happen. Coming off an impressive loss by only 7 points to conference co-leader Chattanooga, the Bears are confident they can pick off their next opponent, the Citadel. With Western Carolina the only team beating the Bears by more than 7 points, The Citadel will have a difficult time picking up their first conference victory in Macon, with the Bears celebrating their first Homecoming as members of the SoCon. After a crushing defeat last Saturday at the hands of the Samford Bulldogs, the Paladins look forward their trip to Lexington and VMI. But, not so fast, the Keydets, with only WCU and the Citadel remaining on their schedule, see the Paladins as their best opportunity to pick up a elusive conference victory. This week the Keydets are home against the Furman Paladins. The Keydets see this as a winnable game after Furman's crushing defeat last week, and their best opportunity for a conference victory the remainder of this season. One of the most important games to be played in Cullowhee in many seasons takes place on Saturday, November 1st 2014. On that day, that the #14 nationally ranked Chattanooga Mocs cross the mountains into the great state of North Carolina, finally arriving in the Cullowhee valley - to face the Catamounts. Both teams are undefeated in Southern Conference play this season, with identical 4-0 records. This game is for sole possession of first place in the Southern Conference standings, and firmly puts the winner in the driver's seat and able to control their own destiny on the road to a conference championship. The loser, while not out of the race, will be tied with Wofford at one conference loss each. Wofford is on a bye this week. The Mocs were the preseason poll favorites, while the improbable Catamounts were judged to finish the season about 5th place. To the surprise of all but the Catamounts themselves, the Cats are off to a 4-0 Southern Conference start for the first time since 1978, and are perfect in games played in Cullowhee this season. At 6-2, the Cats have won the most games since seven victories in 2001. The Chattanooga Mocs reached the 4-0 conference record (for the first time in school history) with their narrow 38-31 win over newcomer and second season football team, Mercer. In that game, the Mocs had their second highest offensive output of of the season at 542 total yards (359 passing and 183 rushing). Moc quarterback Jacob Huesman is credited with 458 of those yards, which includes a career high 359 in the air on 14 of 25 attempts, with two touchdowns and one interception. Series history: Having first played in football in 1973 between the two teams, the Cats own a 16-24-0 record against the Mocs, UTC currently owns a 5 game win streak against the Cats. and hold a 10-9 record in games played in Cullowhee. Their coach: Russ Huesman - The 2013 SoCon Football Coach of the Year is entering his sixth season as head coach. Since taking over in 2009, Chattanooga is 31-25 underHuesman. Last year’s record: 8-4 overall, 6-2 Southern Conference - The Mocs received a share of the 2013 Football Championship with a 6-2 conference record. The Mocs shared the title with Furman and Samford. Last season's game vs. Chattanooga: October, 5th 2013 - Chattanooga quarterback Jacob Huesman tossed four touchdown passes and rushed for a fifth as the Mocs handed Western Carolina a 42-21 loss at Finley Stadium / Davenport Field. Huesman threw for 223 of UTC's 432 total yards of offense, adding 49 yards on the ground in the victory for the Mocs. Tailback Keon Williams rushed for 127 and a score in the winning effort. Chattanooga converted three WCU first half interceptions into 14 points, while limiting theCats to just 63 total yards in the opening half to carry a 21-0 point lead into the locker room. Losses/Weaknesses: - The Moc defense took the biggest hit in losses, losing 6 starters, two linebackers, two safeties, and two cornerbacks. The defense also lost 3 additional lettermen - a defensive tackle, a linebacker and a cornerback. Strengths: - The offensive side of the ball returns 8 starters, and defensive end Davis Tull, tight end Faysal Shafaat and defensive tackle Derrick Lott are preseason All-Americans, helping the Mocs to a No. 10 national ranking in the Lindy’s preseason top-25, No. 12 in Athlon and No. 14 in The Sporting News poll. Western Carolina and Chattanooga both won Saturday, setting up a showdown between the two teams in Cullowhee on November 1st for sole possession of first place in the conference standings. Both teams are currently 4-0 in conference games. While down in Spartanburg, the Terriers are saying, "What about us?" Realistically the race for the championship will not be over even after the showdown game in Cullowhee next week. However, with just three weeks remaining in the conference season, the team that wins Saturday's game, controls their own destiny. If that team wins out - they win a championship and the auto berth to the NCAA playoffs. The loser of that game will join Wofford (who has a bye week) with just one conference loss, and in need of outside help to get a share of the conference crown. This season could certainly end up much like last year with multiple teams tied for first at the end of SoCon play. More on that later. Lets look at how this week's games played out. Mercer at Chattanooga: Mercer put in a scare for the Mocs and came within a touchdown on Jagger Lieb's 42-yard field goal in the fourth quarter. The Bears final two drives both fall short as last second pass broken up as time expired. The Mocs Jacob Huesman completed 24 of 36 passes for 359 yards and two touchdowns. Huesman also rushed for 99 yards. Not to be outdone, Mercer's John Russ passed for 293 yards and two touchdowns. VMI at Wofford: The Terriers kept their playoff hopes alive with a 38-3 spanking of VMI on Saturday in Spartanburg, improving their conference record to 3-1. Wofford held the Keydets to just 197 total yards of offense, as the picked up 499 yards of offense, with 374 of those yards on the ground. Wofford's Lorenzo Long ran for 125 yards and a pair of touchdowns, and Octavius Harden added 100 yards. VMI's freshman quarterback Al Cobb finished with 111 yards passing. Samford at Furman: The Paladins were shut out by Samford 45-0 for Homecoming in Greenville, SC. This was the first shutout of the Paladins since they fell 33-0 to Clemson in 1998 and the first by an FCS team since Georgia Southern won a 21-0 victory in Greenville in 1992. Samford took control of the game almost from the beginning as the Bulldog's Deion Pierre blocked a Furman punt, and Jay Galloway raced the 15 yards to the end zone. Samford's Michael Eubank completed 22-of-33 passes, passing for 314 yards and a touchdown, as Denzel Williams rush for 101 yards and two scores. Both teams now have two conference losses and while not mathematically out the running, both are probably out of contention for the league championship. The Citadel at Western Carolina: The Cats put up a big second half, scoring 22 points, while holding the Bulldogs to just 7, winning by a margin of 29-15 over the Bulldogs. The win matched Chattanooga's 4-0 record in league action, to keep the two teams atop the SoCon standings. WCU's Troy Mitchell completed 21 of 29 attempts for 291 yards, and gained another 131 yards in 15 carries. Mitchell also complete one touchdown pass while freshman Detrez Newsome ran for two TDs. This week's Purple & Gold Catamount Player of the Game for the victory over The Citadel Bulldogs is Troy Mitchell. Junior quarterback Troy Mitchell accounted for 422 yards of total offense. Mitchell threw for 291 yards passing on 21-of-29 passing attempts and a game-high 131 yards rushing, as well as one touchdown pass to pace the Catamount offensive attack. Mitchell's favorite passing target was slot receiver Terryon Robinson who hauled in 10 passes. On Saturday, the Catamounts earned their first 4-0 start in the Southern Conference since 1978, as they ended a three game slide to The Citadel Bulldogs. Troy Mitchell was 21 of 29 pass attempts, for 291 yards, and rushed for 131 yards in 15 carries for a total of 422 yards. Mitchell threw for one touchdown and Detrez Newsome ran for two more as the Cats outscored the Bulldogs 29-15. The Cats remained unbeaten this season in Cullowhee and the Saturday's victory keeps the Cats tied with Chattanooga for first place. "What a fun league this is to be a part of. Anyone can beat anyone else every week," said WCU head coach Mark Speir after the game. "The team just battled and kept their composure. This team has a lot of faith and trust in each other. We made some adjustments on defense - that is what Championship teams do, they find a way to win. I'm proud of our coaches, week in and week out putting together great plans and putting our players in the right position." He added, "It is fun to have a crowd like this in Cullowhee, a packed house. I say it each week and I mean it. I thank the good Lord for putting me in Cullowhee for this time and this place." "We are going to enjoy this win over The Citadel tonight, and now get ready for the big game against Chattanooga next week. Who would have ever thought a conference kind of title bout would be in happening in Cullowhee this deep in the season considering where this program has been?" said Speir about next weeks meeting with Chattanooga. Catamount Homecoming 2014 from WNC Television on Vimeo. We're in week nine of football, and this season has flown by up to this point. Leading the league is preseason favorite Chattanooga, and the preseason fifth place pick, Western Carolina. Should theses two win their respective games this week week, it sets up a monster showdown in Cullowhee on November 1st between these two league leaders. In other action this Saturday, VMI travels to Spartanburg in search of their first league win, while Samford is at Furman in a battle to remain relevant in the conference race. Now, on to the picks. Welcome to this week's Purple & Gold SoCon Power Rankings for the week beginning 10-20-14. The power rankings are published weekly on Tuesday. The Southern Conference will feature four conference games this week, and no out of conference contests. The first of Saturday's games kicks off at 12:00 pm as Mercer travels to Chattanooga. Next up, it's VMI at Wofford and Samford at Furman, both games have starting times at 1:30 pm. The final game is The Citadel at Western Carolina with a 2 pm kickoff. Lots of possibilities for a shake up this week, but if both Chattanooga and Western Carolina end the day with victories, it sets up a huge game in Cullowhee the following week, with first place on the line, that game will not lock up a championship, but it certainly would put the winning team in the driver's seat and master of their own destiny. The Mocs are coming off a surprisingly easy win in Charleston and face a determined Mercer Bear team that will probably upset someone this season, so it's best not to look past them to next week's Western Carolina game. The Cats remained tied for first place in the conference as they picked up their second road conference win of the season defeating Mercer, In the Catamounts Homecoming game they face a Bulldog team that was somewhat embarrassed by the Mocs last week, so the same advice applies, don't look past the Dogs to the Chattanooga game next week. Last Game: Wofford 24 - Samford 20 Record: 4-3 (2-1 SoCon) - Up next - VMI, 1-7 (0-3 SoCon) Still in the race for a conference championship, the Terriers face last place VMI in Spartanburg. It should be an easy pick up, but VMI is going to surprise someone. The Bulldogs dropped a close game to Wofford last Saturday, but combined with the loss to Chattanooga, puts the Bulldogs back to the wall in this week's game facing Wofford. Three SoCon losses would most likely eliminate any chances of a repeat conference crown in Birmingham. Much like Samford, these Bulldogs backs are to the wall as well, finding themselves facing the first place Catamounts. With 2 conference losses already, a third will leaving the Bulldogs playing only for pride. With only one conference loss, the Paladins are still in the thick of the conference race, with a win over the Bulldogs, they can pretty much eliminate the Bulldogs from the race. With three conference losses, the Bears have basically been eliminated from any prospects for a shot at the league championship and have a very big challenge this week. After playing #1 Western Carolina last week, they travel to Chattanooga to meet the other #1 team, Chattanooga Mocs. Record: 1-7 (0-4 SoCon) - Up next - at Wofford, 4-3 (2-1 SoCon) This week the Keydets travel to Spartanburg to play an upbeat Terrier team, fresh off a victory over Samford, This may not be the week, but the Keydets will get that conference victory. This week, the Citadel Bulldogs leave the lowcountry of South Carolina, and travel to the magnificent "Valley of the Lilies" to meet the Catamounts in one of the most scenic locations in college football, E.J. Whitmire Stadium. The Bulldogs hold a 21-15-1 all time record with the Cats and are currently in the midst of a 3 game winning streak over Western Carolina. Western's last victory in the series was in 2010 at Charleston where the Cats picked up a 24-13 win over the Dogs. Due to a scheduling change in the SoCon with the addition of Mercer and VMI, the Bulldogs play in Cullowhee for the second consecutive season. In games played in Cullowhee, the Cats trail the Dogs, 9-10. The Bulldogs are a dangerous team. While the Citadel is 0-2 in the conference with losses to Wofford and Chattanooga, they do run the dreaded triple option offense. The triple option traditionally has given the Catamounts a great deal of difficulty to defend. Combine that fact with the situation that the Bulldogs are coming off a somewhat humiliating loss to Chattanooga in Charleston, by a final score of 34-14. This leads us to believe the Bulldogs will have the incentive to come to Cullowhee with something to prove, not only to the Catamounts, but the entire conference as well. What better way than to knock off one of the two teams sitting in first place? The Citadel currently sits in second place in the SoCon in total offense, averaging 388.3 yards per game, and are in first place in rushing offense, picking up 307.1 of those yards on the ground. \ Quarterback Aaron Miller leads the Bulldogs in their rushing attack and averages 91.3 yards per game, good enough for second place in the SoCon. Tyler Renew is second in rushing on the roster with a 55 yard average per game. Their coach: Mike Houston - Houston led Lenoir-Rhyne to the NCAA Division II national championship game last season, and was named the 24th head football coach of The Citadel on January 9th 2014. In his last three seasons as the head coach at Lenoir-Rhyne, Houston led the Bears to three consecutive South Atlantic Conference championships, including a school-record 13 wins to earn his third-straight SAC Coach of the Year honor. Houston also was named the Don Hansen Super Region II Coach of the Year in 2013. Last Season's Game vs. The Citadel: September 14, 2014 - Within seven points, late in the fourth quarter, the WCU defense stiffened to force a Bulldog three- and-out, giving the ball back to the offense with a chance to pull even. However, an intentional grounding penalty put WCU in a difficult fourth-and-long situation. On fourth down, Mitchell scrambled from the pocket after his initial progression, keeping the play alive with his feet. His offering deflected off his intended receiver, Benson, and was intercepted by The Citadel's Julian Baxter inside the final three minutes. The visitors were able to run out the clock to preserve the victory. Offensive Formation: Triple Option - With the departure of GSU, the Cats will now only face two in conference teams that runs the triple option, Wofford & The Citadel. The two top SoCon teams both took home victories, however Samford's hopes for a second straight SoCon championship took a big hit at the hands of "never give up" Wofford. The Citadel's hopes of contending also were probably smashed as well by Chattanooga. Here's how Saturday's games went. Chattanooga at the Citadel: The Mocs blew out to a 31-0 first half lead over the Bulldogs of The Citadel and never looked bask as they easily handled the Dogs 34-14. The Mocs rolled up 478 total yard vs. only 236 for the Bulldogs. Interestingly, the Mocs out-rushed the Citadel 325 to 198 yards. The Mocs dominated the time of possession, 34:50 to 25:20 for the Bulldogs. Western Carolina at Mercer: The Cats traveled to Mercer for the first time Saturday, and put to rest any doubt they are a contender in the race for a SoCon championship, as they rolled over the Bears 35-21. Troy Mitchell connected with Spearman Robinson on three of his touchdown passes, as Mitchell went 13 of 18 for 194 yards and Robinson had seven catches for 108 yards. Wofford at Samford: In a back and forth game, Wofford's quarterback Michael Weimer scored with 4:34 left in the game to seal a win over the Samford Bulldogs in Birmingham, 24-21. While the Bulldogs won most of the statistical categories, the Terrier won where is counts, the final score. Gardner-Webb at VMI: The Keydets dropped a heartbreaker in double overtime to the Gardner-Webb Runnin' Bulldogs, 47-14. Gardner -Webb was up 31-13 in the third quarter, as the Keydets' Al Cobb mounted a comeback, throwing three unanswered touchdown passes for VMI, Tied 34 all at the end of regulation - both team scored touchdowns in the first overtime period, increasing the score to 41 all, then in the second overtime period, VMI's field goal attempt missed, then the Bulldogs Kenny Cook pulled in a 25 yard pass from Lucas Beatty for the win. Furman at South Carolina: The Paladins traveled to Columbia on Saturday and came away with a 41-10 loss to the Gamecocks, but a $250,000 check from SC made the ride home a little easier. This week's Purple & Gold Catamount Player of the Game for the victory over the Mercer Bears is Spearman Robinson. Robinson hauled in a total of seven receptions on the day for 108 yards and three of the Catamount's four receptions for touchdowns. In the first quarter Robinson pulled in a 33 yard reception from Troy Mitchell for his first touchdown of the day. It was the third quarter before he scored again, this time a three yard pass from Mitchell, increasing the score to 28-14 Catamounts. Robinson's final score came in the forth quarter, at the 12:07 mark as he received his longest touchdown pass of of the day, 42 yards. All told, Robinson had seven receptions for a total of 108 yards. Purple & Gold congratulates Spearman on his selection as the Catamount Player of the Game. The Catamounts took advantage of two of Mercer’s turnovers as they cruised to a 35-21 victory in their first trip to Mercer University Stadium. With the victory, the Cats remain tied for first place in the Southern Conference standings with Chattanooga at 3-0 in the season. In their first offensive drive of the game, Mercer took over on their own 9-yard line. Then on second down, Mercer tailback Alex Lakes was hit and the ball popped loose. Catamount defensive back Jaleel Lorquet scooped it up and returned it 10 yards for for the first touchdown of the game and the Cats never looked back. Quarterback Troy Mitchell showing flashes of himself before his injury at Presbyterian, connected with Spearman Robinson on three touchdown passes. Mitchell's third touchdown pass, a 42-yarder to Robinson, put the game out of reach for the Catamounts at 35-13, with about 12 minutes remaining. Mitchell finished the game with 13 of 18 passes for 194 yards. Spearman Robinson finished with seven catches for a total of 108 yards. The Cats, now 3-0 in conference play, return to Cullowhee next week to meet the Citadel Bulldogs, which lost to Chattanooga today by a final score of 34-14. The Cats and Mocs are currently tied for the league lead. This weekend, in the hopes of boosting the spirit of their fans and team to a fever pitch, the Mercer Bears want their fans to show up wearing all black. To further make the statement, the football team will also wear their black-on-black uniforms, in what is being billed as a "Black Out" to the Mercer faithful. After rolling over winless Ohio Valley Conference foe Austin Peay last Saturday, the Bears are ready for what might be their biggest game played to date in Macon, as they meet league leading Western Carolina. They'll need all that and much more to handle the Catamounts. With two conference losses already, Mercer needs a victory Saturday for any hope to stay in contention for a conference championship. "They are very impressive on both the offensive and defensive sides of the football" said Mercer head coach Bobby Lamb. "It all starts with Troy Mitchell, he's a special player that has done an outstanding job. Of the quarterbacks in our league that I've seen on tape, he's the best one. He's really a dual-threat guy, who excels with his legs and can really throw on the run as well." The Catamounts enter the game with an overall record of 4-2 and are 2-0 the Southern Conference, and currently tied with Chattanooga for first place in the conference standing. Coming off a 26-14 victory over Wofford last Saturday, the Cats are averaging 31 points per game and 377.3 yards of total offense. The Cats will also bring one of the league's best defenses to Macon, as they have held opponents to just 20.7 points per game. The Bears have already played two of the preseason favorites in the SoCon - Furman and Samford, losing by a combined total of only 8 points. "They're a team that's playing really well; they're about No. 1 in every offensive statistic in the Southern Conference, and they're at the top on defense, too," said Catamount head coach Mark Speir about Mercer. "The guys down there know how to win. Coach (Bobby) Lamb is no stranger to the Southern Conference and to championship football. He's doing a great job down there." Game time is 4 pm on Saturday, and can be seen on ESPN3.